For more than ten years, Patricia has worked closely with business owners and individuals, in the Greater New Orleans area, who have a real desire and commitment to plan for their future and maximize their financial resources. Patricia brings a wealth of specialized knowledge to her clients, helping them understand how to manage their investments through the ups and downs of the market, and craft solid plans to reach their financial goals. 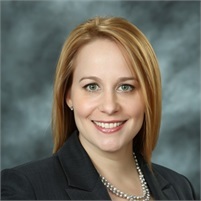 As a CERTIFIED FINANCIAL PLANNER™ she has undergone the extensive certification process for CFP® professionals, which entails a demonstration of thorough knowledge in a diverse mix of financial topics, including retirement, investments, insurance, taxes, financial planning and estate planning. This breadth of knowledge allows her to provide comprehensive investment and planning services to successful individuals with complex needs, in both business and personal financial matters. Patricia partners with business owners through all stages of their business' life cycle, from the early growth years, through the process of attracting and retaining quality employees, all the way through to succession planning. She helps them mitigate risks associated with business ownership and provides strategies for the business owner and their family to continue to reap the financial benefits of their corporate success as they grow. Patricia's work with individuals addresses the insurance, investment and estate planning needs of that individual client and their family. She provides personalized planning that is specific to each client, and that clearly charts a path through all the steps necessary to assist them in reaching their goals. She works closely with clients to identify their retirement goals, and to then review assets and direct their savings toward providing lifetime income. She pinpoints areas that may be exposed to risk, and advises on adjustments as family and personal needs evolve over time, and through life's changes. Originally from the Greater New Orleans area, Patricia received her Bachelor of Science from Rice University. She pursued studies and work abroad, traveling and living in Sydney, London and New York, and working in the marketing and public relations industry before returning to her hometown in 2004 to join her father as a partner at Besselman & Associates. Her involvement in her local community has since grown to include membership in the New Orleans Estate Planners Associates, as well as leadership roles in the East Jefferson Business Association, the March of Dimes Spotlight on Success, the Jefferson Drainage Canal Design Competition, Board Member of the Jefferson Chamber, 2014 Chair of the Jefferson Chamber Young Professionals Committee and a supporter of a number of philanthropic organizations. Patricia is a 2014 recipient of the Gambit Magazine's "40 Under 40" award. As per Patricia: "I am incredibly fortunate to have the opportunity to continue to support so many wonderful community members in achieving long-term personal and professional financial success. My goal is to build upon the solid foundation of unparalleled customer service established by my father, and to grow Besselman & Associates into a truly multi-generational service provider, enabling our clients full access to comprehensive financial guidance through their lifetime, their retirement, and into the next generation."